Repairing fire damage requires careful attention to detail. 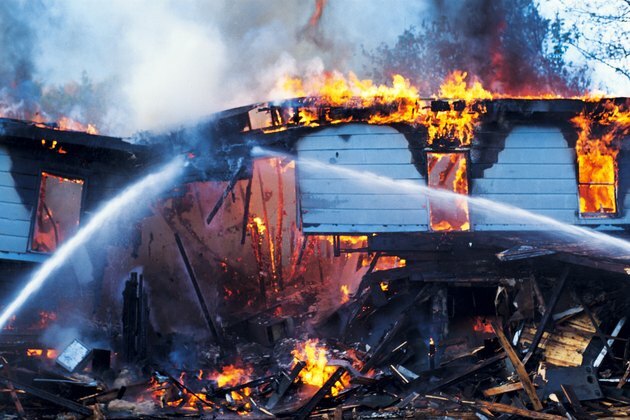 Insurance companies often under-compensate homeowners for fire damage versus offering funds to rebuild the entire structure. This leaves the homeowner in a stressful situation that requires stretching the allocated settlement to cover a lot of damage. Enlist the help of an expert builder and electrical contracting company to assist. Rebuilding the home will require that safety issues are taken care of and the home's structure is as good as it ever was. Hire a builder to examine structural damage. Inspect all exterior sections of the house and make notes about damage. Ask the fire marshall to come on site and help review the situation. Never enter a home until expert carpenters have cleared debris and assessed interior damage. Your building contractor might need to bulldoze part of the house away or tear off a garage addition that's been burned. Repairing fire damage is not a job for the average homeowner, but you can get involved in some of the cosmetic cleanup and repairs such as painting or installing new cabinets to save money. Ask the building contractor to clear away one entryway and begin removing charred wood and debris. The framing of that section of the house must be fully examined. Clean up the house room by room and use hand tools and a crowbar to remove drywall, charred flooring or burned window casings. Look carefully to see how much of the house is not damaged in any way. Spend monies initially to repair what is worst, versus doing any cosmetic improvements at all. Inspect the basement foundation and floor joists supporting the home's weight. Pull away drywall to inspect every load-bearing wall in the house. A load-bearing wall is holding up the weight of the floor or roof above it, so repair each one carefully before you move to another. Only an experienced carpenter will know how to construct the exact framing for these important walls. Never hire carpenters' assistants to work on reframing a burned house. Use their labor for small tasks. Rebuild all areas of attic trusses that were burned and place new floor joists in the attic, if necessary. Once the interior framework of the house is intact, start to repair all exterior walls and the roof area. Install new windows, if necessary, to protect the interior from rain. Install a new breaker box and new electrical wiring as needed for the house. Go room by room to complete the interior once the exterior needs have been addressed. Install drywall in all rooms and rebuild any bathroom or kitchen areas of the house. Salvage any cabinets, bath or kitchen fixtures or undamaged wood flooring to reuse. Negotiate with the insurance company for greater compensation if damage repair costs exceed monies allowed. Ask the fire marshall to help you create documentation of your needs. After the house is painted, finish the flooring last. Install crown molding and wood trim, plus basebaord materials throughout the house.